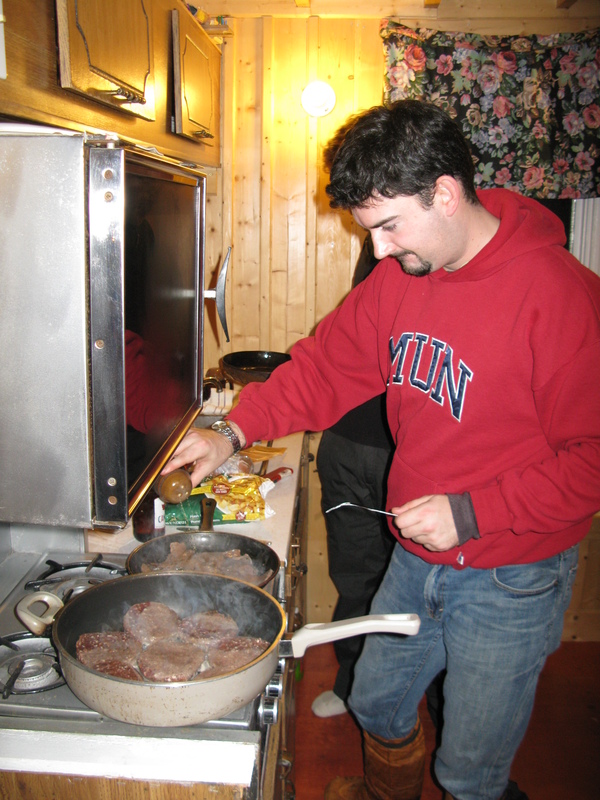 A little salt and a shake of pepper at the flavour to savour as I cook the moose patties and thin moose steaks. 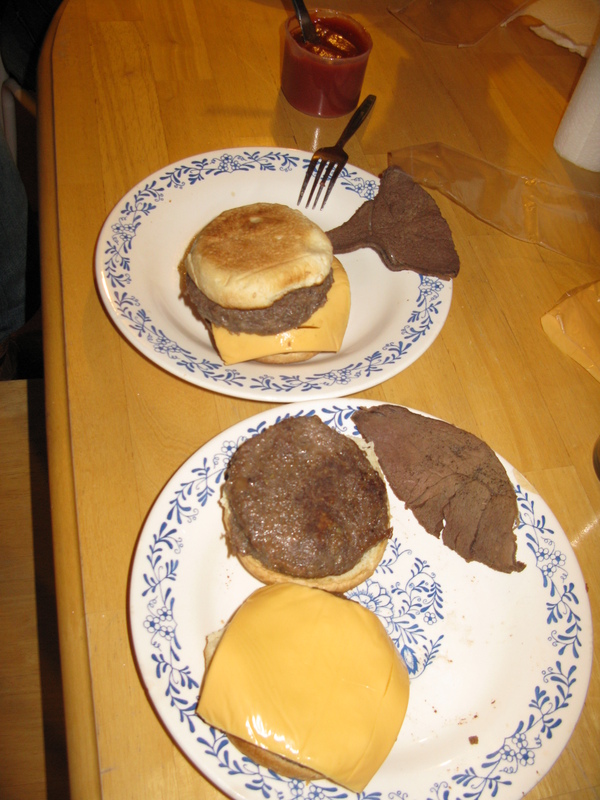 The result – A double moose cheese burger, steak and well we had some hash browns as a side. This is not a menu item you will find at McDonalds or other fast food chains in Newfoundland & Labrador. If you are lucky you may find a restaurant or two that actually sells moose on the menu. This is surely not for lack of demand. Moose Burgers are a hot item at Jackladder Gas Station outside Deer Lake on Route 430 or the MayFlower Inn & Adventures, Roddickton, NL. 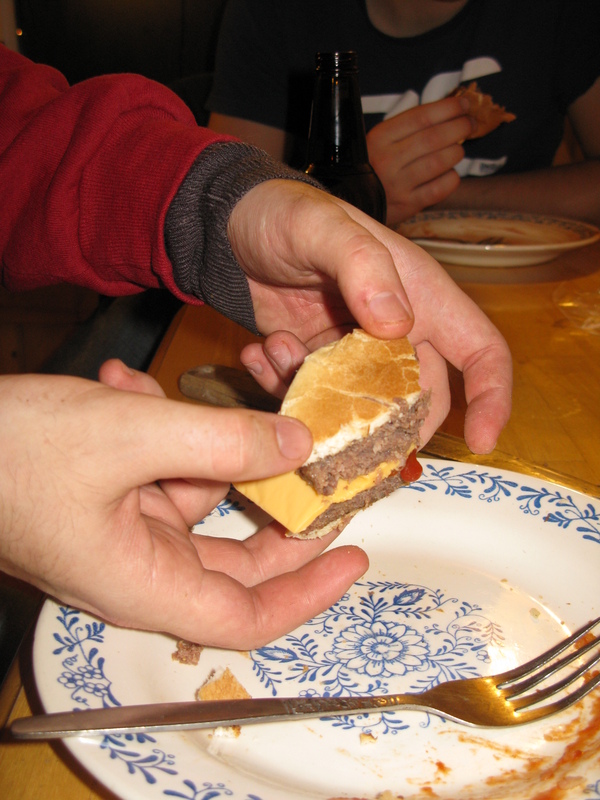 Since we had an extra burger we opted to share between the three, creating the 1/3 burger not the 1/3 pounder or 1/4 pounder but the 1/3 burger. Maybe these will catch on with a toothpick as a party appetizer? The Great Northern Peninsula would not be the place it is today without a feed of moose. We have to be careful, and may need to reduce licences in the Straits-White Bay North as moose are getting scarce. Even in the Moose Capital of the World – Roddickton, there are fewer and fewer moose. If you get the opportunity when visiting, try a moose burger! Why are moose not being ranched to produce moose meat for retail at supermarkets and restaurants on a larger scale, without impacting the annual hunt? Posted on January 30, 2012, in Cuisine, Vacations and tagged Great Northern Peninsula, Labrador, McDonalds, Moose, Newfoundland & Labrador, Roddickton, Straits-White Bay North, The Straits White Bay North. Bookmark the permalink. 2 Comments. You can’t go wrong with a feed of moose. It tastes even better when your out in the woods. You’ve got that right. Thanks for the comment!